There was a time when the homes we lived in were bitterly cold during the winter months. We’d huddle around antiquated baseboard heaters or gather round the undersized fireplace, hands thrust out towards the heat in a desperate attempt to get warm. In the face of such cold recollections, it might seem like the central heating of today is virtually a godsend. Winter no longer holds sway over the interior of our homes, and we can live in relative comfort with the convenience of individually temperature-controlled rooms. No more cold feet, numb fingers and runny noses. But there’s a dark side to central heating that most of us choose to ignore. Research (and my own personal experience) is now showing that living in perpetually hot, dry rooms probably isn’t ideal for our health. In fact, central heating is doing your health some serious damage. Here are five reasons why you should open the window or switch the heating off whenever you get the chance. 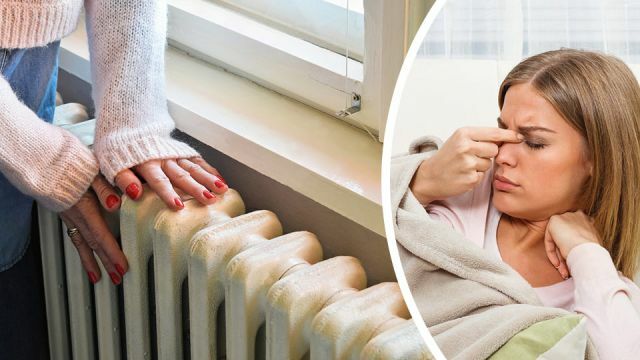 Having grown up in a house without central heating, when I went to live in the city for university I was surprised by how dry my skin, hair and even eyes were during the winter. Not only that, I constantly suffered from bleeding noses, and seemed to get sick far more than I did back home. It took me a while to realize that it was the central heating that was literally turning me into a human raisin! And it turns out, this is a more-than-common occurrence over the course of the colder months. Dry, recirculated air drys out the mucus membranes in the nose and respiratory passages, causing it to thicken and become scab-like. The result is pain and discomfort in the sinuses, and a greater risk of bleeding noses. My approach was simple: invest in a good humidifier, and a cheap but serviceable hygrometer. Using the hygrometer, I was able to keep tabs on the relative humidity in my home, and would turn on my humidifier whenever the humidity dropped below 30 percent. If you don’t want to invest in a humidifier, boiling a couple of pots of water and placing them around the room to disperse their steam works almost as well. Scientists have long known about the way in which cold exposure can promote an increase in something called brown adipose tissue. The key physiological function of brown adipose tissue is to convert the calories in food into heat — essentially forming our internal central heating system. Generally speaking, then, the more cold you expose your body to, the more brown adipose tissue you develop and the less white adipose tissue you have… meaning more efficient heat production, and a slimmer waistline. By constantly keeping your house warm with central heating, then, you’re actually causing your body to accumulate more white fat, and this means serious weight gains. To test this theory, researchers exposed 24 healthy men to “thermoneutral” conditions of 22°C (72°F) and to mildly cold temperatures of 16°C (61°F) and measured their brown adipose tissue activity. They found that 23 out the 24 men had increased brown adipose tissue activity under the cold conditions, but no change whatsoever in the neutral (a.k.a. warm) temperatures. They also found that both BMI and body fat decreased with an increase in brown adipose tissue (BAT) activity. To increase your BAT and decrease the amount of weight you put on this winter, be sure to get outside into the cold as much as possible. Better yet, have a cold shower every other day to stimulate thermogenesis and stay slim! According to experts, moving from hot to cold rooms can elevate blood pressure, which in turn can negatively affect blood supply to the heart. The result is an increased risk of stroke, angina and even heart attack. Keeping all your rooms at a “coolish” temperature of around 18 degrees reduces the blood pressure spike when you step out into the cold. Our eyes are protected by a natural film consisting of mucus, water and oil layers. The water and mucus are designed to keep the lens of the eye hydrated, and the role of the oil is to prevent those two layers from evaporating or hardening. Under sustained dry conditions, however, such as in a house that’s centrally heated, the oil layer fails to fully protect the inner layers and the film of the eye dries out. The result is initial watering eyes as the water layer seeps out around the oil, then the eye lens itself begins to dry out. This can present all kinds of problems for your eyes, and over time can seriously damage your vision. Once again, the best solution is to have a humidifier running while the heat is on to keep things nice and moist. Other methods include leaving bowls of water around your home, and having well-watered houseplants in every room. Sudden increases in temperature, such as when you come inside from the cold and warm your hands over the radiator, can cause your blood vessels to spasm and cause your fingers to rapidly change color from pink, to white, to blue and then red. This process can damage the hands over time, and can be a real problem for people with Raynaud’s syndrome. The solution should be pretty clear: don’t warm your hands directly over the radiator! After you come inside from the cold, allow your hands to slowly warm via the ambient air temperature instead. Hey Buddy!, I found this information for you: "Central Heating Makes You Fat + 4 Other Ways It’s Hurting Your Health". Here is the website link: https://www.thealternativedaily.com/how-central-heating-is-hurting-your-health. Thank you.